How to Build Your First App – Without Coding. When exploring the digital options available to boost your company’s online presence, the thought of an app may well fill you with fear as you consider where you would even start and the potential costs associated with such a venture. With more shoppers going mobile to hunt for the best deals through events like Black Friday, discussions around the creation of a mobile app should be at the forefront of your marketing plans in order to tap into this ever-expanding market. The concern of app development being a difficult, lengthy and expensive process doesn’t even need to be a factor in your thinking when you can utilise the incredible app builder options available to you from us here at AppInstitute. We have designed our app building process to be simple and straightforward so that no matter what your level of technical ability, you’ll be able to produce an end result that will wow your customers. But where do you get started and what can your business benefit from when building an app through our software? The great thing about our app builder is that you can go through the wizard and get a link to preview your app on your smartphone before you even sign up! All you need to provide us with is your mobile number and then away you go – no commitment necessary. Create your free account to customise your app further. The app builder platform allows you to customise your app’s appearance and content, allowing you to add the features that best suit, your business needs and goals. Once you’re completely happy with what you have developed, you can publish your app by choosing one of our flexible AppBuilder plans. The app builder also allows you to build one app that works on any mobile device, offering a one app fits all solution. Once you’re ready to go live, you can decide on the plan that suits you best. Our drag and drop design makes choosing features to be included within your new app incredibly easy, and within just three steps you can be ready for launch. When it comes to the appearance of your app, you have complete control. You can customise the theme to fall perfectly in line with your current branding through custom colour schemes, uploading your company logo, choosing your font style to even uploading your own custom icons. 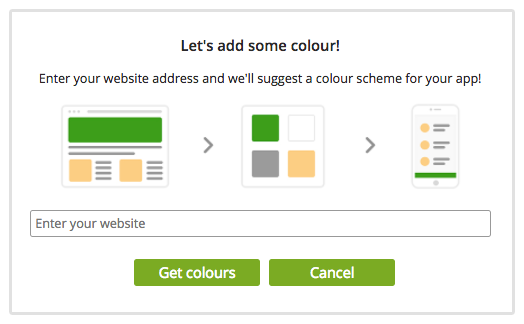 To make your life even easier, after you enter your web address during the initial stages, the app builder will automatically generate four colour schemes based on the colours found on your website. This means you can achieve the perfect match and avoid the time-consuming process of searching for hex codes! Everything about our app builder is customisable. Take your menu layout for instance; you can opt for the traditional tab bar style along the bottom, a sleek slide-out side-bar menu or even easy to identify icons so it’s as simple as possible to users to navigate to different areas of your app. Each app template in our selection comes with pre-loaded content which can be easily edited to suit your own business. Editing, removing and adding content to your app is simple. Click to edit any feature or choose from over 20 powerful app features to customise your app further. Whether it’s an about us page with details of your company’s contact and social information, a services pages that outlines all that you have to offer, loyalty programs or simple to use forms, you can customise your content to create an app suitable for any business type. Whether you’re a tech wiz or a bit of a novice, you can create an app that is unique to your business, that enable you to connect to your customers on their preferred device, all without writing a single line of code. There you have it, you’ve worked on the design and added your own content to each area of your app, so the final thing to do is publish and tell the world that your new snazzy app is live and kicking. Any business type, from coffee shops to nightclubs, hair salons, driving instructors, charities and many more can take advantage of mobile apps, with our variety of built-in features working for a range of different organisations targeting a variety of audiences. Mobile coupons – Incentivise customers to download your new app by offering exclusive discounts with mobile coupons. These redeemable coupons can have set start and end dates to suit your offer and can help drive those all important sales. Coupons can be particularly effective in driving sales during quiet periods of the year or to promote special occasions! Food ordering – With the rise of food ordering apps like JustEat and Deliveroo, consumers are used to ordering food with just a few clicks. Create and customise your own food ordering app and benefit from great features like one-click ordering without the huge commission fees. Gallery – Promote your business with gorgeous images with your own photo gallery. If you’re a hair salon, easily upload the latest photos of the stunning cuts and colours you have done for clients or if you’re a builder, why not showcase all the work you’ve completed, including projects both large and small? Getting started, building your app from scratch and then launching is really only the start of the process, and is certainly just the start of the journey with us at AppInstitute. We want to help you make the most of your new app, so supply a 30 day app success plan which covers all the things you need to do in the early stages to help achieve your long term goals. We’ll equip you with social sharing tools so you can push your new app on the likes of Twitter, Facebook, Instagram and LinkedIn, alongside any other platforms your business currently utilises in addition to advice on growing your email database, leveraging local press and the reach they have plus so much more. You’ll also be able to access your app’s analytics data to view downloads, app actions as well as download sales reports across customised time frames to track the success of campaigns or learn how much revenue your app is making. If you wanted even more in depth analytical information, you can link your app with Google Analytics to identify most viewed pages, where your traffic is coming from amongst many more insights and reports. Once you’ve got a captive audience, communicating with them to keep them that way is the next crucial element, and with push notifications offering an average 97% open rate, with 90% of those messages being read within 3 minutes, you can benefit from one of the best ways toconnect with customers almost instantly. Use push notifications to promote exclusive deals and discounts, send important updates, reminders and much more..With the addition of geo-fencing technology, you can even target specific locations and customers who may be close by to your bricks and mortar store with deals and offers via the push notification method too. 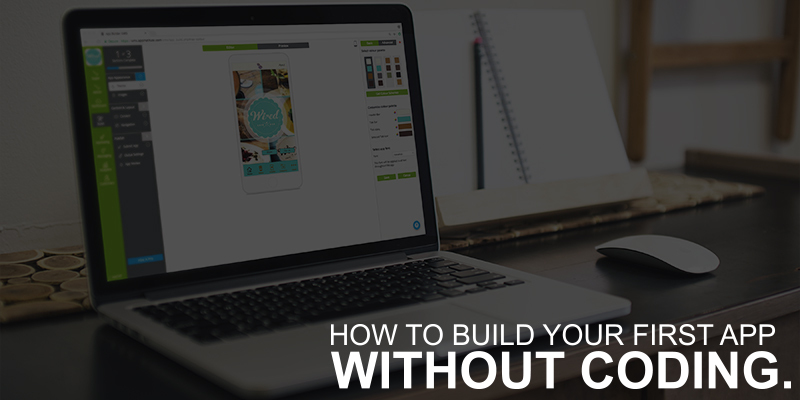 Building your first app for your business doesn’t have to be a scary, daunting prospect. 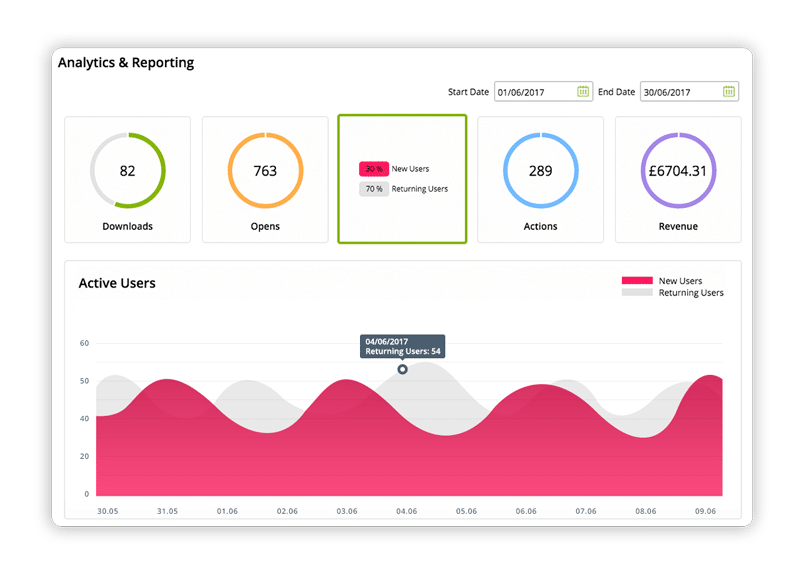 With AppInstitute the process is easy, stress free and affordable, and most importantly provides you with complete control over how your app looks, functions, feels and targets your customers. Take the plunge and delve into the world of the mobile app to take advantage of end results that will blow your customers away and put you ahead of the competition.